Nintendo has announced that they're packing Pokemon X and Y with their 2DS handheld. The bundles will hit select retailers throughout North America on December 6th. 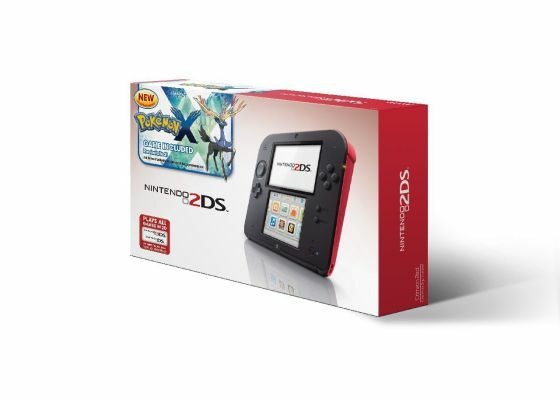 Target will offer a red Nintendo 2DS with Pokemon X pre-installed on the device. Toys "R" Us will stock a blue 2DS with Pokemon Y. Both bundles are $149.99. The 2DS by itself typically costs $129.99, so you're essentially getting Pokemon X or Y for half of its usual $39.99 price. The 2DS is a budget alternative to the 3DS. It can play 3DS and DS games but doesn't have stereoscopic 3D visuals. Other than the new tablet design, it's very similar in terms of hardware. The handheld has a touchscreen, analog stick, three cameras, gyro and motion sensors, etc. It also possesses the multiplayer functions of the 3DS including StreetPass and multiplayer. Pokemon X and Y are the first fully 3D games in the main series. Players journey across the Kalos region in a bid to become the top Pokemon master. They'll acquire new Pokemon and take old favorites to new heights with Mega Evolutions. X and Y are also the first main Pokemon titles to be released exclusively on the 3DS rather than the DS. The 2DS opens the games up to players who either don't want to pay the higher price of the 3DS or don't want its stereoscopic 3D. It's no surprise that Nintendo released the 2DS alongside X and Y this October. They recognized that the games would be a good opportunity to push players to upgrade to new hardware. If you'd rather have an actual 3DS, note that Nintendo previously released special 3DS XL's inspired by Pokemon X and Y. Those handhelds have exclusive artwork based on the Legendaries introduced in the two games. They were released in limited quantities and have been available since September so you might have trouble finding them by now, though. Like the X and Y 3DS XL's, the 2DS Pokemon bundles will also be available in limited quantities. Considering how popular X and Y are, they could get snatched up mighty quick. Nintendo hasn't mentioned yet whether this bundle will be released elsewhere in the world.